Cristina Gordet is the new World Veterans Bronze Medalist! 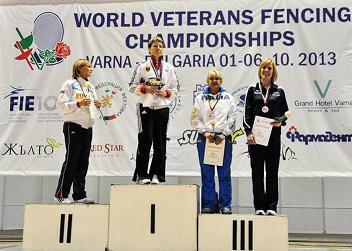 Olympia Fencing Center is proud to announce our fencer, Cristina Gordet is the new World Veterans Bronze Medalist! After winning the National Title this summer, in Columbus, Cristina and the US Veterans Team has embarked for Varna, Bulgaria, where as many as thirteen countries, including Italy, France, Russia, Germany, competed for the World Title. Taking up fencing because her daughter fenced, eight years later (including last four years of training with Daniel Hondor, Olympia’s head coach), Cristina not only achieved her dream, as an athlete: to make the US World’s Team – but became one of the world’s medalists! Passion for fencing, perseverance in training, ability to overcome the downs of the sport and never entirely happy with her results, wanting more and more, discovering her inner self and staying in control of her emotions – here she is, bringing the Bronze medal home, to US and her club, Olympia Fencing Center. Following her achievement in Bulgaria, at the 2013 World Fencing Championships, Cristina Gordet placed now number one in the USA, for her group age! Congratulations, Cristina and thank you for your hard work and dedication, for being so proud to be part of our club! 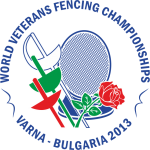 This entry was posted in Club News and tagged bronze/medal/, bulgaria, Cristina/Gordet, varna, veterans/world/fencing/championships/2013. Bookmark the permalink.